Running a startup is no piece of cake. There is a constant hammer of uncertainty that only adds to the already existing pressures of limited budget and scarce resources. Each week as the business of startups grow, so does the challenges that come with this growth. As a Project Manager, you can only do so much, monitor and manage team collaboration, maintain time-accountability and assess the progress of your projects. And even then, things can get clunky and fall out of place. To foster an organized workflow, most organizations acquire the help of a nifty task management tool. Because why let everything fall on your mortal human-shoulders when you have a wide array of automated friends to share your burden. Why Use Task Management Software? Before we move onto helping you choose the best task management software, let’s skim through the reasons your emerging business could use one. If you have never used a tool for task management, you will find yourself swimming in a bottomless sea of software to choose from. Which also means, you are equally likely to find yourself investing in the wrong software, which may sound like a good idea at the start but would turn out to be a big source of disappointment. What Does the Best Task Management Software Offer? Does it provide issue tracking and risk assessment for each task or project that you create? Does it facilitate real-time communication with team members for clear & transparent management? Does it allow users the freedom to customize their workspace according to what best suits their preference? Is it visually simple to understand and flexible to use for all sorts of teams? Does it offer a generous set of features at a low price? Does it consist of time tracking features to ensure on-time project delivery? If hopefully by now, you’re convinced that your startup could use the expertise of a management tool, we have reviewed a list of the 22 best task management tools to help you manage teamwork and increase your productivity. nTask is a newcomer in the fierce market of software. It was designed to eliminate the frustration caused by overly complexed tools that are often abandoned by the users halfway down the road. Its specialty lies in its straightforward, elementary format that reduces the learning curve of users belonging to any team type. Free Plan – 5 workspaces, 200 MBs of storage. Pro Plan – $2.99, Unlimited everything. Sign up for the best task management software today, it’s free! Your favorite task management software. Sign up today and organize work smartly. Evident from its name, Teamwork is one of the best task management software focusing on streamlining team collaboration and effort. It offers an impressive tier of project management features that extend from simple task management to time tracking, billing and a lot more. Whether you work with a group of small teams or large, Teamwork will help you strengthen the different forts of your workspace, all under one roof. Free Plan – 5 User, 100 MB storage. Pro Plan – $9 user/month. 100 GB file storage. Approved into use by some of the most influential names across the world, such as Harvard University, Coca-Cola, and Disney, Droptask brings a pleasant twist in the framework of task management. Designed with visually appealing Venn diagrams that permit color customization, it has the shortest learning curve compared to any task management software out there. Free Plan – Unlimited users. Unlimited workspaces. ProofHub may be a tad expensive, but with add-ons like unified communication, email project management, and a multilingual interface, it can be great for larger teams looking to collaborate remotely. It is an easy-to-use platform to manage team collaboration and deliver projects on time. FreshBooks, Dropbox, Google Drive, Box. ActiveCollab is another powerful tool perfect for organizing workflow for small teams and businesses in general. It has been around the block for a decade, and because of its smooth and flexible usability, it has rendered a favorite spot among numerous academic institutions and government organizations. You can manage every aspect of your project be it time tracking, team collaboration or invoicing. Active Collab is a cloud-based app that functions on multiple browsers and can be installed on a personal server as well. Slack, Quickbooks, Google Drive, Dropbox, Asana, Zapier. One of the best task management software that need no real introduction, Trello is the very definition of basic task management. Trello’s specialty lies in its interactively simple Kanban boards that assist quick drag & drop ability of tasks from one column to another. The incredibly generous Free plan of Trello that offers unlimited members, boards and checklists are what has granted Trello a golden spot in the hearts of small businesses and setups. Free Plan – Unlimited users and unlimited boards. Primarily a project management tool, Nifty is gradually becoming a strong name to remember in this crowded market of task management tools. It provides users with a diverse array of features that assist both team communication as well as project management. The meager pricing plan of Nifty is a big business-pleaser for small teams looking to invest in something affordable to enhance team productivity. Gathering clientele, struggling with new deadlines and the processes of recruiting the right team can be a draining process. Startups need something that is not only affordable but also helps take care of multiple dimensions of team and project management. That is where Avaza steps in. Avaza lines up in our list of best task management software due to its comprehensive feature list that lets you manage projects, teams as well as the invoices. Simplify complex projects by breaking them down into manageable work through to-do lists, add details such as a start and end date and view them in Kanban, Gantt charts or lists. Starting with the initial quotation to processing invoices, with Avaza your financials are taken well care of, so you can focus entirely on your project delivery. Avaza makes payment and invoicing even easier through options that allow for conveying and monitoring detailed estimates to potential clients, which you can convert into a project with a few clicks. It also offers an inbuilt client management module that includes a Time & Expenses tab and caters to direct payment through PayPal or Stripe. Zapier, SharpSpring, Stripe, Quickbooks, Xero, Basecamp, Trello, Zendesk, Insightly, Google Docs, Evernote, Jira, DropBox, MailChimp, Slack, Salesforce, and Github. Avaza offers Free, Startup ($9.95 per month), Basic ($19.95 per month) and Business ($39.95 per month) plans. No auto-update for new comments, which means you need to manually refresh page to keep check of new comments. A complete project and task management app with a growing number of subscribers with each passing day, Wrike holds its place as one of the best task management software for teams of all sizes in all industries. Offering a multitude of options with a sleek interface to manage projects encompassing complexity from basic to enterprise, this tool is one of the all-under-one-roof solutions. Beginning with multiple pane views for viewing and monitoring information from different aspects, Wrike makes it easy to stay on top of your projects with little effort. You can organize, prioritize and schedule tasks, engage team members through tagging, customize reports and collaborate with peers with just a few clicks. If you are just starting up, you can start free with a limited number of users and a fixed set of features. You can later upgrade your subscription as your team grows or as the workload and project lists expand requiring a vaster feature set. Salesforce, Box, JIRA, Google, GitHub, Octa, HipChat, Microsoft, Bitium, DropBox, Evernote, Zapier, Zendesk, Wufoo, Hubspot, Marketer, LinkedIn, Survey Monkey, and more. Wrike offers multiple plans that comprise Free, Professional ($9.80 per user per month), Business ($ 24.80 per user per month), Marketers ($ 34.60 per user per month) and Enterprise (customized) plans. Time reporting option is not available. Not as intuitive to work with and takes time to learn. Task management in mobile apps is not as efficient. With a focused but powerful set of features that can help you streamline your task management activities and that is affordable, Basecamp could be your next best task management tool. Basecamp provides channels for instant messaging and real-time chat with groups and individuals, a good amount of file storage, to-do lists for sorting out work related tasks, scheduling work and sharing documents and other information. Plus, it generates reports automatically based on your work summary so it saves you time. Also, instead of juggling between various payment plans, if you like to keep the payment plan fuss free, at a single standard rate, regardless of the team size, Basecamp offers you uncomplicated pricing. This means you don’t need to juggle between saving expenses and growing your team. Unito.io To-Do Sync, Zapier, Automate.io, TaskClone, Project Buddy, Pleexy, Tick, Calamari, Hubstaff, Time Doctor, EverHour, Ganttify, MangoBoard, Workstack, SlickPlan, Bridge24, and more. Basecamp offers one standard price at $99 per month regardless of the number of users, projects or teams. The details associated with each project is limited and scattered across the tool. This means it does not display information under a single view. Limited features for task or project reporting. Lack of options for task or project budgeting. There is no built-in time tracking, however, it can be integrated. There is no customization option. It does not offer an inbuilt instant messaging feature. No search and filter options for files or to-do lists. A task management app, Asana has come a long way and has made a name for itself as one of the best task management software floating the market. You can create and manage tasks individually or assign them to projects as well as follow up on them through various devices. Modules such as My Tasks list and Focus Mode help you focus on more important, more urgent tasks. Team members can easily collaborate with each other on the work at hand through comments, likes and follow options. Plus, Asana makes it easy to share files and other information, and even tag a team member in the comments to involve them in a certain task. Asana saves you the need to use email or other third-party add-ons for collaboration. CSV importer, Zapier, Dossier, TimeCamp, MS Office 365, Salesforce, Slack, DropBox, tray.io, Hipchat, Everhour, OneLogin, Box, and more. Asana offers a Free, Premium ($ 9.99 per user per month) and Enterprise (customized) plan. Hitask is a task management tool that is the perfect fit for start-ups. Comprising of multiple features placed neatly on a user-friendly interface, this app makes it very easy to manage tasks and collaborate with teams. Google Calendar, iCalendar and Microsoft Outlook. Hitask offers Team Free, Team Business ($ 25 per month) and Enterprise ($ 120 per month ) plans. #13 on our list of the best task management software is Aha!. Every start-up and established organization needs to establish a roadmap to clearly set and meet goals and monitor progress accordingly. What’s more? Aha! actually offers a subscription plan that is focused on start-ups. This task management software helps you define your vision, goals, and initiatives to help strategize more efficiently. It also has a separate section for gathering ideas from customers for future improvements. With a drag-and-drop interface, you can list down your project requirements and document features as well as create mock-ups in the same tool. Plus, you get to analyze and share your roadmaps. Efficiently designed modules that hold feature sets focusing on strategy, releases, idea gathering, roadmaps, analytics and more. Drag and drop interface for storing features and requirements through user stories. Scoring card for features to asses which feature needs to be prioritized. Create mock-ups of the features designed. Attaching wireframes, sketches, and inspirations directly to features. Track progress of related features. Comment stream to capture feedback with options to mention colleagues and other features. Customize columns, filter, and other fields. View project status and team activities through Kanban boards. You can integrate Aha! with Jira Software, Visual Studio, PivotalTracker, Rally, Salesforce, GitHub, Bitbucket, FogBugz, Asana, Trello, Slack, Hipchat, Dropbox, Zendesk, G-Suite, Onelogin, Okta, Zapier, and more. With Aha! you can avail Startup (qualification assessment), Premium ($59 per user per month), Enterprise ($99 for product owner or contributor per month), Enterprise + ($149 for product owner or contributor per month) plans. No mobile app for Android. Prices are relatively higher than peer tools. User interface can take some time to get used to. No issue or risk tracking. As the name may infer, this task management solution has you covered all the way from task creation and management to your billing and invoicing. With the number of options this tool provides, it can safely be considered as one of the best task management software on the market. Kanban boards make it easier to adapt the tool in an Agile work process with everything placed neatly on Kanban columns. Start-up teams need a centralized tool for monitoring everything from tasks, to clients, to the finances, which Task2Bill provides. The additional 1GB free storage space makes this option even more attractive especially if there is document management and file sharing involved. Tasks management including listing tasks, prioritizing them, setting task status and posting comments. Kanban boards for re-positioning and monitoring tasks on different status columns through drag and drop. Set milestones for task groups and payments. Track time invested in tasks. Add custom roles for employees according to their responsibilities. Client Rate Chart for maintaining customized and negotiated rates for task services and materials used for calculating quotations and invoicing. Send quotation to clients and negotiate with cost. Accepted quotations, billable tasks and expenses, payment milestones and used materials. Create quick invoices for clients from billable items. Online or manual payments and adjustments with invoices. 1 GB free storage on Task2Bill server. Options to set up meeting, appointments, and reminders. Notifications including configurable email notifications for actions, Web and Slack notifications. Generate advanced reports for projects, people, timesheet and sales activity. Add multiple contacts for your company or for your clients. Task2Bill can be integrated with Quickbooks online, Everhour, Slack, Google Calendar, Dropbox, GoToMeeting, JoinMe, and Zoom. Task2Bill offers a Basic (free), Starter ($15 per month), Pro ($25 per month) and Advanced ($50 per month) pricing plans. No mobile apps for iOS or Android. Proworkflow is one of the best task management tools for teams that are just starting up and picking pace. With pre-defined templates, you can take control of your task management process and not the other way round. Customize your workflow, manage timesheets and corresponding reports, team messaging and document sharing. A major concern of newly formed organizations is to keep track of finances and monitor rightful investment of resources. With the invoice management and quotation handling feature set, Proworkflow helps you steer your finances in the right direction without having to worry about any critical element slipping by. Also, you don’t need to juggle between multiple views, instead you get access to updates and task progress and a lot more through a single, comprehensive view – the dashboard. Proworkflow can be integrated with Xero, QuickBooks Online and QuickBooks Desktop, KashFlow, FreshBooks MYOB AccountRight, Box Storage, Dropbox, Google Drive, Microsoft OneDrive, and Zapier. Proworkflow offers Solo ($10 per user per month), Professional ($20 per user per month) and Advanced ($30 per user per month) subscription plans. No risk or issue tracking. Scoro makes its way to this list of the best task management software for a number of reasons. It is a complete business solution that offers a broad spectrum of features including task and project management, team management and customer relationship management. Scoro makes it easy to keep track of tasks and projects all the while giving you ample options to oversee team progress. For customer-oriented businesses, it is especially useful to keep track of customer issues and be able to attend to their queries through the same platform. This prevents start-ups from the extra expense that may otherwise be incurred by investing in multiple solutions for different requirements. Scoro also helps you maintain documentation and manage invoices and billing. With so much to offer, Scoro is a must have for start-ups in any industry. You can integrate Scoro with Xero, Zapier, GetApp, Outlook, iCal, DeskTime, QuickBooks, MailChimp, DropBox, Toggl, Google Calendar. Scoro offers Plus ($22 per user per month), Premium ($33 per user per month) and Ultimate ($55 per user per month) subscription plans. Brief makes it to the 17th spot on our list of the best task management software for startups. Although it does not offer a huge spectrum features, the modules and capabilities it does offer is perfect for start-ups. It is equally useful for small and large teams. It comes with a clean interface and has is easy to work with. Create and manage tasks with options that include task forwarding and group task assignment. Plus, you can assign tasks during discussions and this not only saves time but gives you an easier way to get work done. With an option to create multiple private or shared team workspaces and topic creation for teams, manage different teams in their own way through a single tool. A centralized view helps you oversee and monitor workspaces with the corresponding activities. Hubs to organize your chats, tasks and files. Integrations are in the pipeline. Brief offers a Free, Pro ($10.99 per month) and Enterprise ($13.99 per month) plan. A powerful to do list and task manager, Todoist leaves a mark by providing some solid task management features for you and your team. The tool allows you to quickly track your startups’ progress over time through a handy feature set. Like some of the best task management software, Todoist also comes equipped with native project templates to eliminate the hassle of creating similar projects from scratch. If you’re prone to forgetting things, use the quick add functionality and instantly jot down whatever comes to your mind. The color labels, tags, and themes further allow you to organize your tasks the way you want and according to your priorities. An interesting feature of the tool is the Karma points. Every time you complete your tasks, you earn Karma points and level up. You can also track your performance by analyzing Karma trend and streaks. Todoist comes with a massive library of integrations to help you achieve more. Some of the prominent ones are Google Drive, Dropbox, Zapier, Slack, IFTTT, Time Doctor, and Amazon Alexa. Omnifocus is a beautiful task management software designed for Mac and iOS devices. A GTD app at heart, Omnifocus makes task management efficient for you. Although the myriad of features Omnifocus comes with may seem a little too overwhelming for starters, but if you’re looking for a complete task management solution, look no further. Easily add actions using Siri to process things faster. Furthermore, for executing tasks in a workflow manner, make use of customizable tags to make tracking and monitoring of tasks smooth. These tags could refer to any context, ranging from location or people, to priority levels of actions. Through the forecast feature, which shows your calendar, keep an eye on upcoming tasks for the day and plan accordingly. There are numerous apps which come integrated with Omnifocus. Some of these are, Evernote, Airmail, IFTTT, TaskClone, and many more. Omnifocus comes with different plans catering to Mac and iOS devices. The tool also comes with discounted plans for educational and business institutions. Another comprehensive task management software, Zoho Projects provides a powerful suite of features that let you manage your tasks with minimum confusion and maximum efficiency. The core functionality of the tool revolves around social networking while getting things done. That is, Zoho Projects comes with a rich toolset comprising of multiple collaboration channels for you to keep everyone in loop. Some of these channels are team chat, online team communication forums, and interactive feeds. In addition to that, through task dependencies and milestones you can track your task relationships and your projects’ most significant events in order to understand what you need to do next. The software comes with built-in extensive reporting capabilities to help you gain useful insights regarding where your project stands at the moment. Zoho Projects facilitates multiple integrations ranging from Zoho’s internal apps (Zoho CRM, Zoho Desk, Zoho People, and many more), to other applications like Google Apps, Microsoft apps, and lots more. You can make use of Zoho Projects through 4 plans. Free, Standard ($20 per month), Express ($40 per month), Premium ($85 per month), and Enterprise ($125 per month). If you’re looking for a user-friendly, yet a comprehensive task manager, Flow might be one of the best task management software for startups. 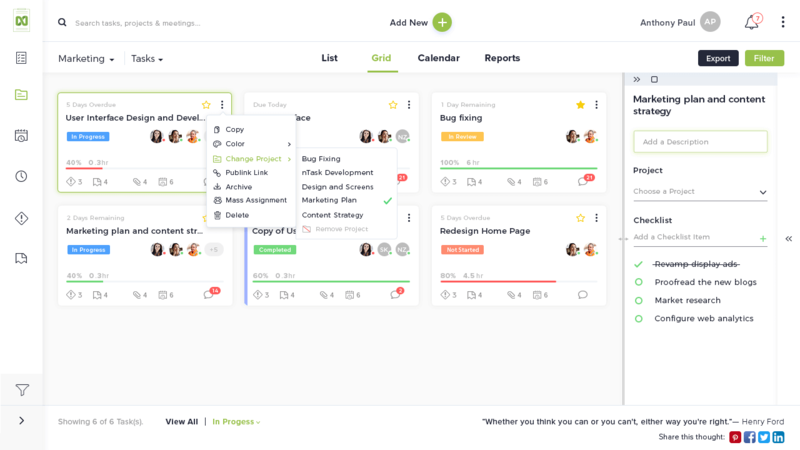 Through a visually appealing and intuitive user-interface, Flow makes task management even more fun. The project timelines allow you to plan your project by week, day, or month. The easy drag and drop lets you quickly schedule the upcoming tasks and lay out the individual workload on your timeline. You can also catch a quick glimpse of your project performance through project dashboards. If you have a large team working on multiple projects, Flow caters that too. Create workgroups for each project or team and start adding tasks. Furthermore, apply useful filters to keep your attention towards the critical tasks. You can integrate Flow with Dropbox, Box, Google Drive, Slack, Harvest. Flow comes with two easy plans. Flow ($4.79 per user/month) and Flow Pro ($7.99 per user/month). Taskade is a simple and flexible online team collaboration tool and task manager that lets you organize and collaborate on your ideas through checklists, notes, and audio/video calls. The simplicity of the tool is the reason it made to our list of best task management apps for startups. The real-time collaboration features of Taskade provide an excellent platform to stay connected with your team and streamline communication for completing tasks effectively. These features are audio/video calls, team chat and comments, and files sharing. The tool also comes with built-in templates to help you plan your work ahead of time and get geared up quickly to get things done faster. Taskade doesn’t come with any third-party application integrations. Taskade can be subscribed through two plans. Free, and Pro ($7 per month). Although not every task management app in our reviewed list meets each criterion necessary for selection, we leave the final decision up to you. Keeping your startup’s framework in mind, its limitations and your strengths as a project manager, select and find out which task management software will best catapult your business.